Derive a CHM in R using raster math. If you have not already downloaded the week 3 data, please do so now. 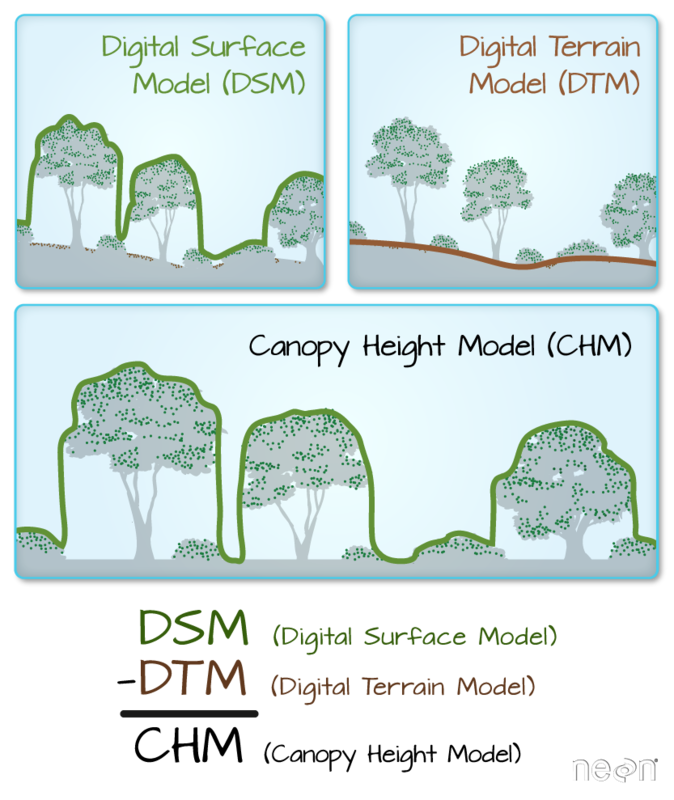 Digital Terrain Model (or DTM): ground elevation or the elevation of the Earth’s surface (sometimes also called a DEM or digital elevation model). Canopy Height Model (CHM): The height of objects above the ground. In the previous lesson, you opened a digital elevation model. The digital elevation model (DEM), also known as a digital terrain model (DTM) represents the elevation of the Earth’s surface. The DEM represents the ground - and thus DOES NOT INCLUDE trees and buildings and other objects. 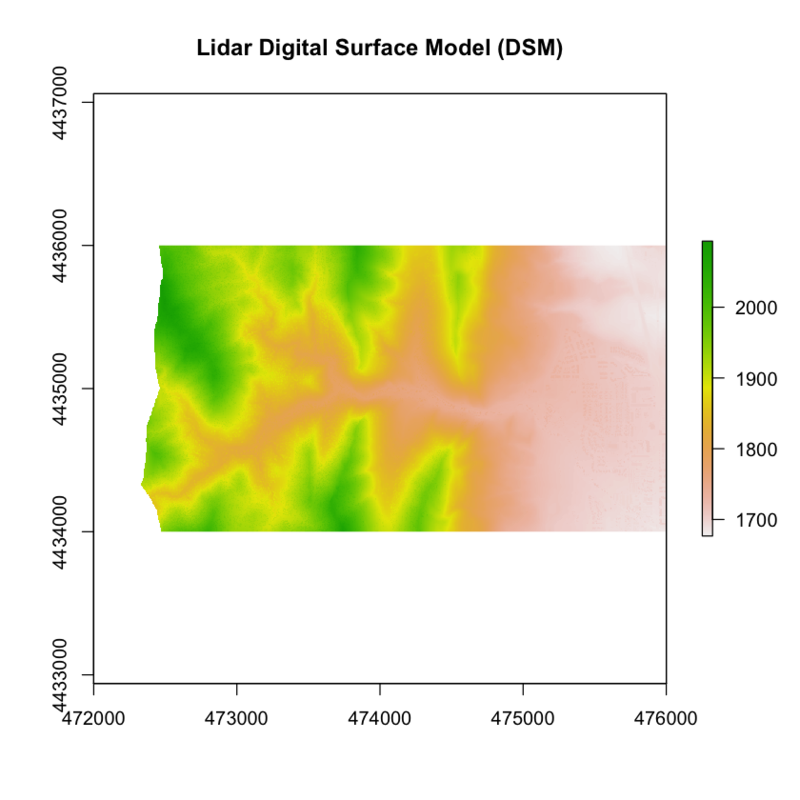 First, let’s open and plot the digital elevation model. The canopy height model (CHM) represents the HEIGHT of the trees. This is not an elevation value, rather it’s the height or distance between the ground and the top of the trees. 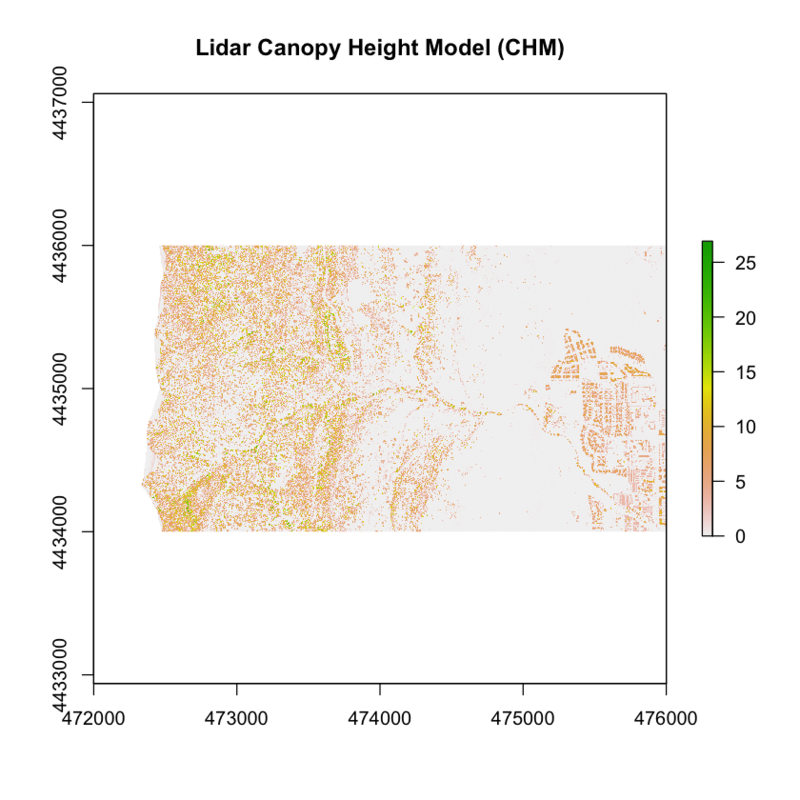 Some canopy height models also include buildings so you need to look closely at your data to make sure it was properly cleaned before assuming it represents all trees! Sometimes a gradient of colors is useful to represent a continuous variable. But other times, it’s useful to apply colors to particular ranges of values in a raster. These ranges may be statistically generated or simply visual. Let’s create breaks in your CHM plot. We can export a raster file in R using the write.raster() function. Let’s export the canopy height model that we just created to your data folder. You will create a new directory called “outputs” within the week 3 directory. This structure allows us to keep things organized, separating your outputs from the data you downloaded. NOTE: You can use the code below to check for and create an outputs directory OR you can create the directory yourself using the finder (MAC) or Windows Explorer. Data Tip: You can simplify the directory code above by using the exclamation ! which tells R to return the INVERSE or opposite of the function you have requested R run. 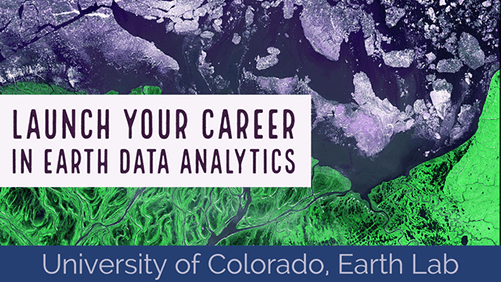 Now that you’ve learned about the three common data products derived from lidar data, let’s use them to do a bit of exploration of your data - as it relates to the 2013 Colorado floods. Subtract the pre-flood DEM from the post-flood DEM. Do you see any differences in elevation before and after? Create a CHM for both pre-flood and post-flood by subtracting the DEM from the DTM for each year. Create a CHM DIFFERENCE raster by subtracting the pre-flood CHM from the post-flood CHM. Plot a histogram of the CHM DIFFERENCE. Export the files as geotiffs to your output directory then open them in QGIS. Explore the differences. 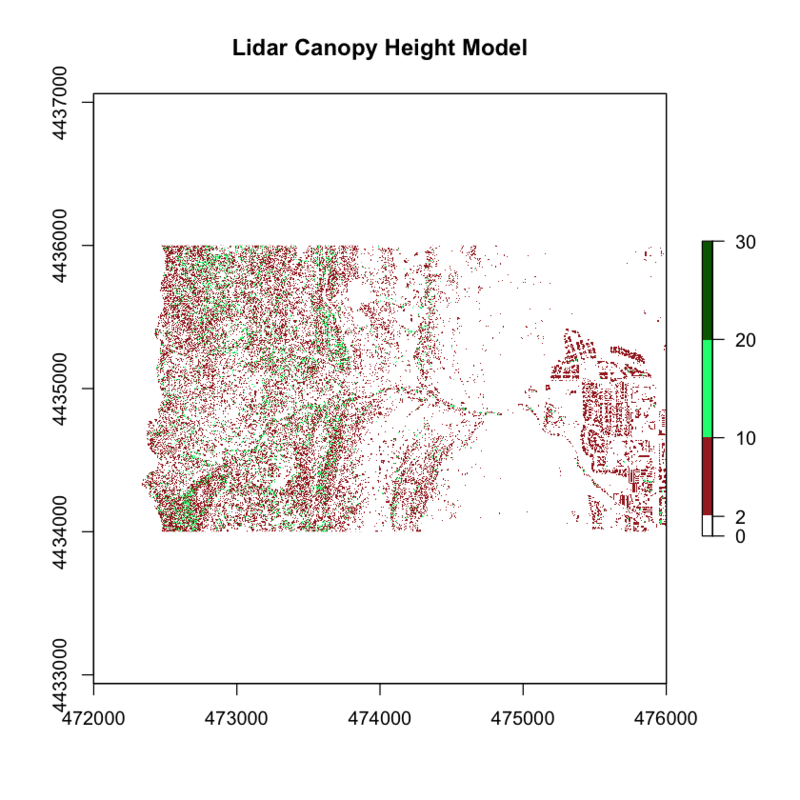 What differences do you see in canopy height between the two years?